Divakar's Musings | There are times when you must take a few extra chances and create your own realities. I am always curious about how questions are asked in the meetings, discussions, TV Debates. I strongly believe Quality of Questions ask yourself is directly proportional to quality of life you live. I was introduced to Marshall Goldsmith in 2008 in Toronto Public Library attracted to his book “What got you here won’t get you there”. I am following him and his influence to my life is very much because of his methods and also on his Daily Question process. Self-Reflection is a tool to reflect on our life. Every day I ask myself by answering 10 questions that represent behavior that I know which is most important, but easy to neglect or avoid on daily chores. I am fascinated with Marshall Goldsmith and his book “Triggers” me to join on his Executive Coaching Certification on Stakeholder Centered Coaching and the Daily Question process. It is an eye-opener for me and changed me to gain my focus . The following 10 questions helped me to shape my day and continuously asking the questions everyday and capturing it in a spreadsheet. Diligently am following to respond to this 10 questions every day and scoring myself and this helped me to say “No” to my Mindless browsing or chat with friends on phone calls or and having a laser focus on my Zero Inbox everyday. Beyond all this, when we were having a family dinner and casually my son who is at his 5th grade certified me that “ I can see a difference in dad that he talks to me nowadays “. I feel my son’s feedback is the greatest feedback I received after my Daily question process. Daily Question Process works very so well because it pushed me to reflect everyday on my values. What questions you want to ask yourself, every day ? Write the questions that you need to ask yourself everyday ? If you need help on writing questions, please do feel free to call me and love to help you.. Decide now to ask questions everyday… Your life will be better. Did you ever had a supervisor or client who pushed you beyond what you thought you could do? Or a leader who inspired you to give more than 100 percent? Then you are working with Multiplier in action. Leaders who use their intelligence to amplify the smarts and capabilities of the people around them. These are the leaders who inspire the people with whom they work to stretch themselves and surpass expectations. These leaders use their smarts to make everyone around them smarter and capable. Did you ever had a supervisor who is holding his team back, despite with good intentions ? Well-intended Leader often following popular management practices , who subtly and , completely unaware , shuts down the intelligence of others. 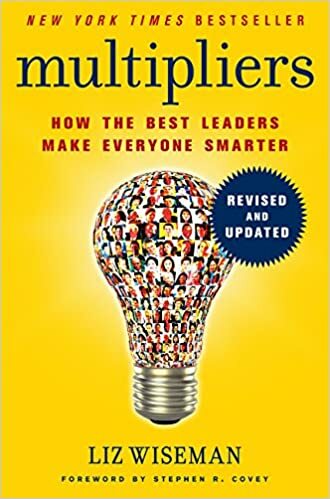 Leaders who use their intelligence to amplify the smarts and capabilities of people around them are Multipliers of intelligence—they inspire employees to stretch themselves to deliver results that surpass expectations. These leaders hold a unique set of assumptions about intelligence. Multipliers see an abundance of intelligent people and assume that people are smart and will figure it out. This core assumption is at the root of the five leadership practices that distinguish Multipliers. 5) instill ownership and accountability. Multipliers don’t get a little more from people around them—they get vastly more. Multipliers utilize people at nearly 100 percent of their capacity, meaning they get twice the capability from their people than Diminishers do. Visionaries: Visionaries are big thinkers who lay out a compelling picture of the future and evangelize it. But they might be providing too prescriptive a vision to their team and not leaving enough space for others to think through the challenges and build the intellectual muscle to make the vision a reality. But instead of engaging his team’s enthusiasm, his effect was the opposite—and people became apathetic. Idea Guys are fountains of creativity, and their minds race with non-stop ideas. They may think they’re sparking innovation, but they cause whiplash as people scurry to keep up with each new idea, making minor progress in many directions. Rescuers: Many well-intending managers jump in and rescue their people or a project to help the person avert failure and get on the path of success. But when rescuing struggling people, you weaken their ability to think for themselves and to learn how to spot problems and recover from them. Instead of creating a cycle of success, you create chronic dependency on the leader. Ask Questions . Ask clean questions ..
Share Ideas : – Introduce few ideas, and leave white space. Give Accountability : Give Accountability and trust them. How Productivity increases for Knowledge workers ? Knowledge workers do their best when they can access their creativity & intuition. According to Mihaly Csikszentmihalyi , author of book Flow : The Psychology of Optimal experience explains “Flow” as , flow, also known colloquially as being in the zone, is the mental state of operation in which a person performing an activity is fully immersed in a feeling of energized focus, full involvement, and enjoyment in the process of the activity. Awareness on Conscious Mind, our mind is able to track only 4 things at a time. According to American Psychology association, we are thinking on an average 40,000 to 60,000 thoughts per day through sub-conscious mind. However, conscious mind is able to prioritize only pressing things which will give results. CAPTURE: Capture everything in a system or journal that you will refer. REFLECT: Reflect daily, weekly, monthly. It gives you a focus and activates the Reticular activating system (RAS) . So that conscious and sub-conscious mind supports to achieve the desired outcome. “Essentialism is about how to get the right things done. It is a disciplined, systematic approach for determining where our highest point of contribution lies then making execution of those things almost effortless . This book showed a deep understanding of how to live a life true to ourself, and also teaching a method for being more efficient, productive and effective in both personal and professional realms. There are four parts of the book where the first outlines the mind-set of an essentialist and the remaining three parts in to a systematic process of the Essentialist. 1. What was the purpose of this book? The Purpose of this book is to live a meaningful life by identifying what really matters and also a framework to live as a Essentialist . George Mc.keown explains with a beautiful greek word, ‘metanoia’, refers to a transformation of the heart. He argues with a clear points by asking questions and provides answers from Essentialist and Non-Essentialist perspective. 2. . After reading the book, interest been piqued about the subject matter ? “Which Problem Do I want ?” , As Micheal porter confirms “ Strategy is about making choices , trade-offs. It is deliberately choosing to be different “. Mc.Keown provides an approach how to do trade-off. Trade-offs are not something to be embraced and made deliberately, strategically, and thoughtfully. 3. Was there a specific passage that had left an impression, share the passage and its effect. The above passage in the Clarify chapter has an in depth meaning of the essentialism and its philosophy of “Disciplined pursuit of less”. Personally it helped us to identify our intent and the way how can we easily decide on what was important right now ?. As Greg Mc.keown mentioned in the book “ What was important right now, what was important right now was to figure out what was important right now ! What is Code Halos ? ” The halo in the term Code Halo refers to the data that accumulates around people, devices, and organisations – data that’s robust , powerful and continually growing in richness and complexity. The halos contain the code that companies, brands, employers and partners can use to enhance their understanding of people or objects more deeply. “. Everyone has a Code Halo.. How is it formed ? What does it contain ? Everyone of us started using internet for everything and sharing about us in a great way . Especially the firms such as Amazon and Google interact with our richselves, they recognize our thinking patterns and understand our interests, friends interests, likes and dislikes. Today we hav a pattern of searching about an key executive in Linkedin is normal and know about his likes, dislikes etc., and strike the conversations are common in the business world. Especially the testimonials plays a vital role in Linkedin to know about the individual. Our Blogs communicates clearly about our key interests , thoughts and it becomes a data in the internet world. Amazon, Flipkart are very smart in gving offers based on our buying behaviour and interests . Predictive Analytics plays a vital role in our daily life ..with our data. – Know who we are as well as our preferences, characteristics, and associations. – Understand how we like to interact and how we don’t. – Direct us effortlessly to what we are looking for. – Remember every detail of our interaction in internet is very key ..
Are we having an awareness on Code Halos ? What is my Personal Code Halos ? Am I sharing the right data in the Internet world to know about me ? How am I earning my two currencies ” TRUST” and “CONTENT” in Virtual world ? A quick review of an unique book. Today happens to be India’s Republic Day; a celebration dating from a momentous day in 1950 when the great country turned into a republic and a new constitution came into play. The weather is mild this morning and there is hint of a drizzle – nature seems to be enjoying the moment as well. Congratulatory messages are pouring in from all quarters with Indians all over the world sharing wishes and smiles in honour of the valiant efforts of their countrymen several decades ago. As I type this message, I wonder – what is it that we could wish for our country on such a pivotal day – what is the one thing that we need most of all – as a person, as a partner, as a society and as a country in a connected world? If Rama himself is answering the above questions , how would we feel ? Writer Ravi tried to respond in a beautiful way in his Book “The Exiled Prince”. I have read the few sample chapters via @Sandeepvarma and waiting for the remaining chapters how Rama is telling his story . Leadership and Self-Deception is an excellent book authored by Arbinger Institute. ( Group of person written together). In Chapter 4, ‘The Problem beneath Other Problems’ . I would like to describe the theory short and it is a key for all our problems. Ignaz Semmelweis is an European doctor , an obstetrician worked at Vienna’s General Hospital in 1800s. He was upset when he found that the mortality rate was one in ten in his ward and the mortality rate was one in fifty in mid-wives ward. He did lot of analysis with patients in the both the wards and found everything is normal. He standardised everything from birthing positions to ventilation and diet. He even standardised the way the laundry was done. He incredibly discouraged. Semmelweis gone for a vacation for 4 months and found that the mortality rate decreased and matched with one in fifty in his ward. Gradually, his inquiry led him to think about the possible significance of research done by the doctors on Cadavers. Semmelweis discovered that the only significant difference was that he, spent far more time doing research on the cadavers. He developed a theory, ‘particles’ from cadaers and other diseased patients were being transmitted to health patients on the hands of the physicians. He immediately instituted a policy requiring physicians to wash their hands thoroughly in a chlorine and lime solution before examining any patient. This is called Germ Theory and it resulted in to Mortality rate to 1 in 100. In same way, there is a similar germ we carry to one extent to another , a germ that kills leadership, a germ that causes a multitude of ‘people problems’, a germ that can be isolated and neutralised. Let us self-introspect and discover our germs before we start identifying the reasons for challenges. I got an opportunity to discuss with Sukumar ( sastwingees.org) about this challenge and he guided me about “Work – Life Integration” which is the key part to succeed in today’s knowledge workers life. 2. I was surprised by Yahoo’s CEO Marissa Mayer, the idea that someone could achieve a healthy work-life integration when having a baby seemed too hard to believe and back to work in short span . If she is able to manage successfully her work, and I trust, we can learn effectively from her . 3. Work – Life integration is a cultural change agent and will bring lot of benefits which lead to positive eustress . 4. Find ways to squeeze your work and life whereever applicable instead of spliting or divided. 5. Capitalising the technology , Social, Mobility to a great extent to use it effectively. 6. As mentioned in Forbes article, let us do not try to balance anything. Second, try to integrate instead, which requires some real awareness of our preferred behaviors, self-identity, and sense of control. This is one of the interesting blog. A friend called up the other day. He had recently moved to a semi-independent role from a managerial role for a large portfolio and he was surprised that the attention he had been garnering until recently had gone down significantly. “Are they ungrateful or am I not the leader I was anymore?” he wondered. We mused this over a pot of coffee and a few cups of tea (we had one of those uber coffee shops nearby). He really had been a good manager, so this wasnt about people acting up. Not at all – so what was happening? As Peter Drucker defines “Change that creates a new Dimension of performance”, this work shop made a change and shown me a path to a new dimension of Performance. Shared how he turned Sick a Company to 1000+ crores organization. Identify the Key Problems in your organization. As a Chairman, he integrated the whole system and solved. Burning problems of customers is an opportunity to innovate which can lead new business. Interesting examples like educating a customer or vendor will help lot to sustain in business. Interestingly he is aged 70+ and the way he exhibited energy is fantastic. I was very much thrilled to know about Creativitywhack cards (deck of 64 cards with illustrations and strategies for stimulating creativity). According to me , this is the best example of “Connect the Dots” . Roger Von Oech (http://en.wikipedia.org/wiki/Roger_von_Oech) who connected his thought with brilliant 64 creativity strategies is the example of out-of-box thinking. Ashish changed the culture of the workshop in a different way by introducing himself and also he motivated others to follow the same model. He started with his Big Bang approach. Asish explained, “To Change the culture, underlying beliefs need to change” . A profound statement and he shared with a metaphor of Tree. “Root of the tree are Underlying Beliefs or Assumptions”. If we need to build an innovation culture, we need to have an underlying belief to innovate. Not to criticize other’s ideas. It was fulfilling and wonderful Saturday to learn more about Innovation from Innovation Evangelists. About Inception Business Services: Inception Business Services (IBS – inception.net.in). This is the first workshop of Inception and the founders arranged it in an innovative way. Thanks to organisers and their goodie ( Bookmark ) also very innovative.